Another box pouch!! yes! your right! 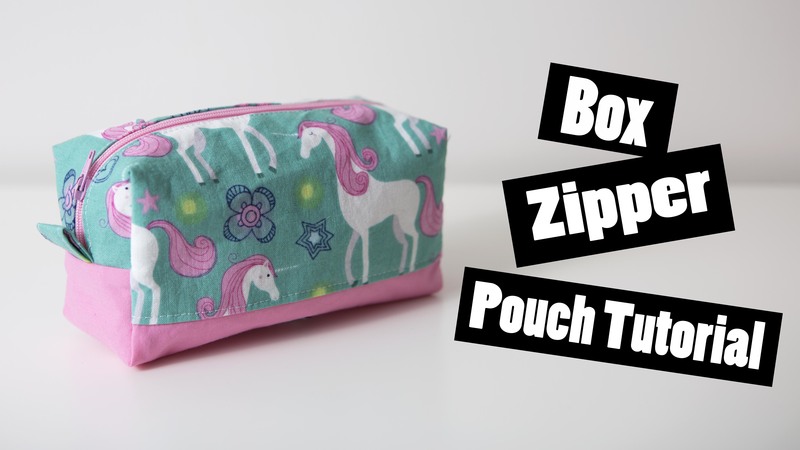 I’ve made a box pouch in the past but this version has no raw edges which was a big complainted with my first tutorial! Keep Ashley’s Patterns and tutorials free! Donate to say Thanks! I chose to make the outer fabric out of 3 pieces so i will provide measurements for 3 pieces or just 1 piece down below! I press my seams towards the fabric i want to top stitch and top stitch with a longer seam allowance 1/8th of an inch away from the edge, this gives your bag a more polished look! Step 4: flip up the fabric to the otherside of the zipper to sandwich the zipper between the outer and the lining, we will sew this one a little different, leave a 4″ gap in the centre of this seam. **Caution – Make sure you put the zipper Pull inside so you dont cut it off! Step 8 – Now this is where it can get tricky and hard to explain through photos, if you have difficulty I urge your to please check out the video tutorial! with each corner pull the opening and line up the seam with the centre of the fabric, then you will do thesame with the lining fabric cut out. line up the outer fabric and the lining fabric so the raw edges are lined up and sew a 1/4″ seam allowance. this will feel unatural and undoable but i assure you it is possible and it just takes some working with your fabric to get all the fabric to go where you want it to go. Step 9 – this is how it will look when its all done and ready to be flipped right sides out.